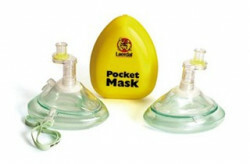 Purchase 50 or more Laerdal Pocket Mask with Oxygen Inlet, Gloves and Wipes in Hard Yellow Cases and download your free support pack worth £100. Purchase 200 or more Laerdal Pocket Mask with Oxygen Inlet, Gloves and Wipes in Hard Yellow Cases and you can have personalised covers absolutely free! Laerdal Pocket Mask with Oxygen Inlet, Gloves and Wipe in a Hard Yellow Case.